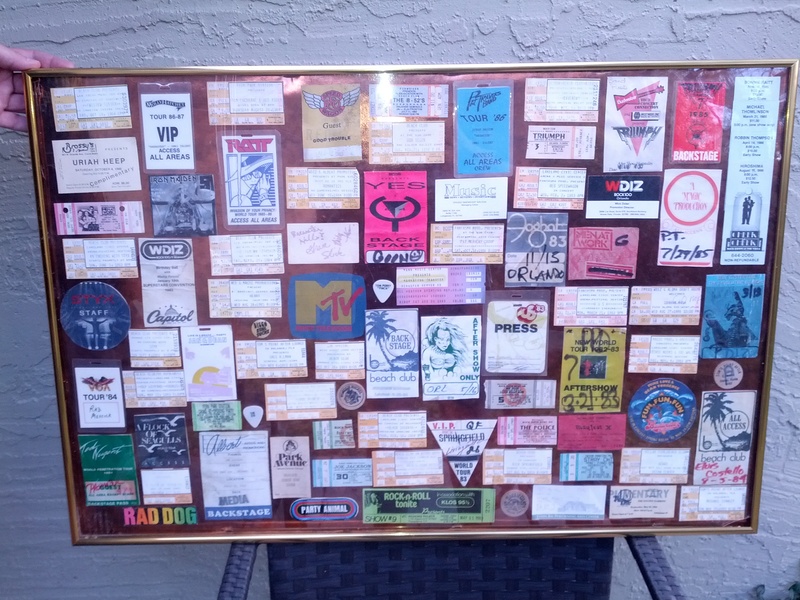 A collection of ticket stubs and press passes from Orlando radio personality, Mick Dolan. The items are collectively mounted and framed, along with several guitar picks, business cards and stickers. Some of the ticket stubs include Twisted Sister at the Lakeland Civic Center in Lakeland, Florida, on October 19, 1984; Uriah Heep on October 4, 1986; The Romantics on June 20, 1984; The Police at Rock Super Bowl XIX on October 29, 1983; The B-52's at Orlando Seminole Jai Alai Fronton in Fern Park on July 1983; Joe Jackson at Bob Carr Performing Arts Centre in Orlando on March 30, 1983; and Bob Seger, Triumph, and Men at Work. Some of the press passes include Molly Hatchet's 1986-1987 Tour; Ratt at Orange County Civic Center in Orlando on December 6, 1985; Van Halen at Lakeland Civic Center on January 22, 1984;, Elvis Costello at the Bob Carr Performing Arts Centre on August 5, 1984; Foghat at Tom's Point After Lounge in Orlando on November 13, 1983; Men at Work's 1985 Tour; Pat Travers Band's 1986 Tour; Rick Springfield's 1983 World Tour; Iron Maiden; REO Speed Wagon; STYX; Ted Nugent; Triumph;, A Flock of Seagulls; and Yes. Original color photograph: Private Collection of Mick Dolan. Copyright to this resource is held by Mick Dolan and is provided here by RICHES of Central Florida for educational purposes only. Turley, Julie, and Stella Gleitsman. Ticket Stubs of the 80's. New York, NY: The author, 2011. Dolan, Mick. 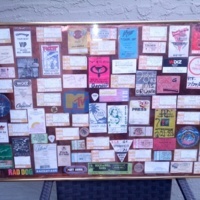 “Mick Dolan's Ticket Stub and Press Pass Collection.” RICHES of Central Florida accessed April 23, 2019, https://richesmi.cah.ucf.edu/omeka/items/show/5199.